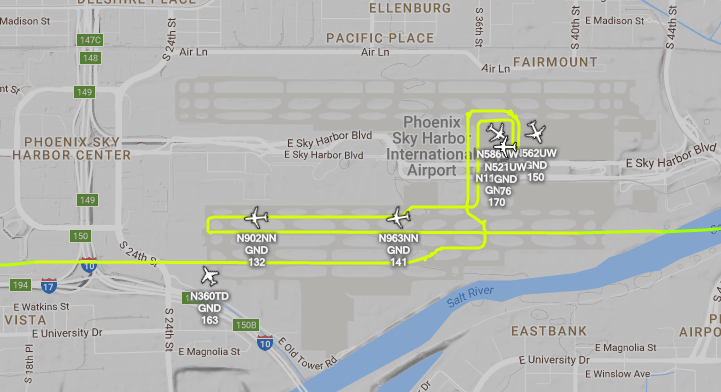 Living next to a large hub airport, and having a good view ADS-B-wise of the airport and a to 200+ nm around it, I get to see flights come into PHX, unload and load, then take off. Case in point: AAL1920. The route it’s currently on is LAX-PHX-MIA. My ADS-B receiver first heard its beacons when it climbed over the Santa Ana mountains in Orange county. It’s now approaching Deming NM and it should drop off my display very soon. Total time recorded is almost 2-1/2 hours, and nearly 9000 position reports. What I find interesting is that as the plane was on final landing to the east (right), it did a little bump in the path just a few miles before the runway. Why? Avoiding a PHX PD copter? Dunno. Once it landed (rwy 8R), it taxied to the even-number side of the A15-A30 part of Terminal 4. Kinda looks like gate 16 or 18. After loading up its passengers, it taxied out and took off to the east on runway 8L. Over a year ago I decided that I needed some good filters for ADS-B reception on mountaintops. Not that I had an immediate need, I didn’t have anything on a mountaintop, but I suppose I had a little extra cash and felt excited to be able to imagine a good ADS-B receive site atop an Arizona mountaintop (or hilltop) location. So, I drafted up what I thought would be a reasonable spec and went into Alibaba to find a filter manufacturer to build one. I ended up with 5 filters, all exactly to my spec, and for a bargain price (well, relatively speaking). 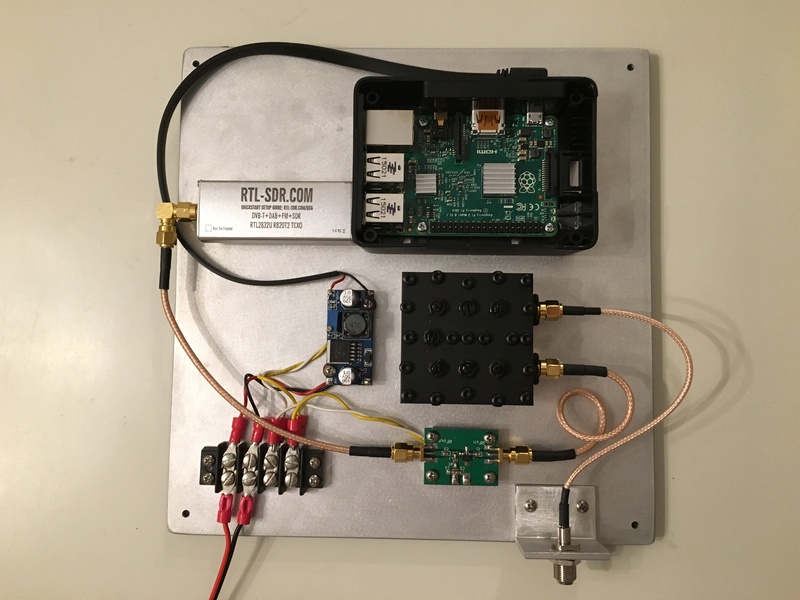 Above is the finished ADS-B receiver assembly, complete with Raspberry Pi, RTL-SDR 1ppm TCXO SDR dongle, a eBay-purchased LNA, an eBay-purchased 12 vdc to 5 vdc DC-DC converter, and some coaxial cabling (also from eBay). The black square in the center of the image is the 1090 MHz filter, and it’s a quite good one. It’s a straightforward cavity filter, a little aluminum brick with fine performance. Solid out of band rejection, and I suspect around -100 dB ultimate rejection. The SA just doesn’t have the range to see it. 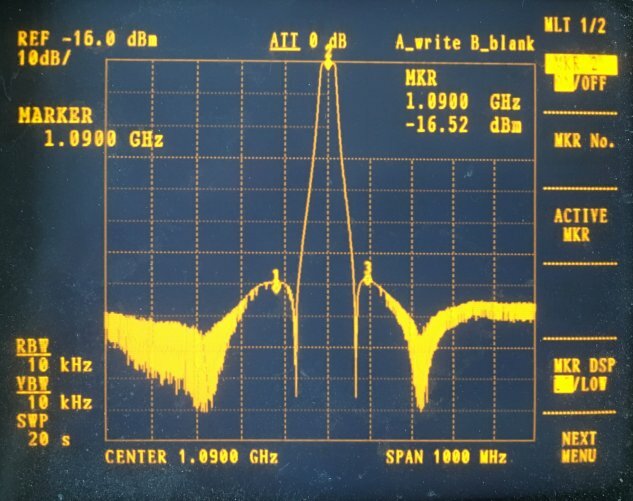 While the signal of interest is only a MHz wide, I wanted a filter that was wider so that temperature and mechanical variation would never haunt me, and I wanted a low bandpass loss (the above shows less than 1 dB loss) across the band. Behind the filter is a run-of-the-mill eBay wideband LNA with a 1 dB NF, and somewhere around +30 dBm IP3. The RPi is running the most current version of FlightAware’s PiAware, rev 3.0.4, and supports just about any off-the-shelf USB SDR dongle. After setting it up, it looked like I needed to reduce the overall gain a bit, so I discovered how to go into dump1090 and change the gain from “automatic” (really not, I think it’s just max) to 42 dB. That gave me best range and most received a/c. The antenna for the site is a FlightAware fiberglass stick, about 12′ above the ground, mounted on the side of the tower. Coverage seems to be pretty close to the model generated by HeyWhatsThat.com (above). The blue line is the 40,000′ contour, while the orange line is the FL300 contour. 24 hours or so of actual flight logs produces the following plot, which is more or less pretty similar to the HeyWhatsThat plot. 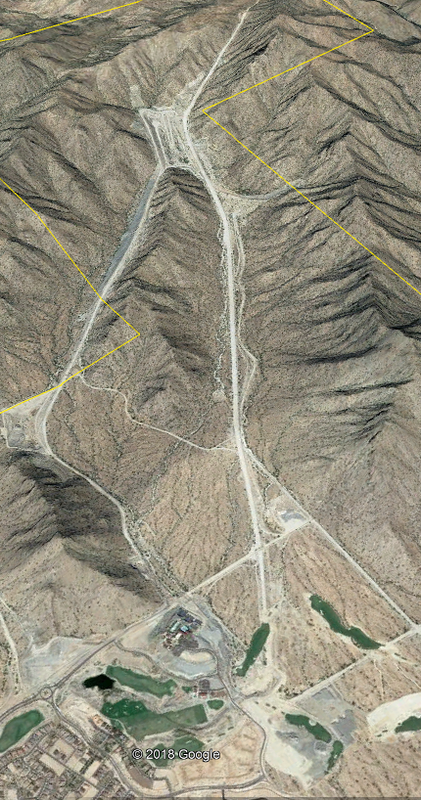 The primary notch in the pattern, in the SE, is the higher part of the ridge on which the radio site sits. It ends up blocking any coverage of flights in and out of Tucson, over 110 miles away, until said flights get to FL300 or so. It will be interesting to see how the coverage shapes out over the next few weeks – I hope that it will get up near the top of all the local receive sites in performance. 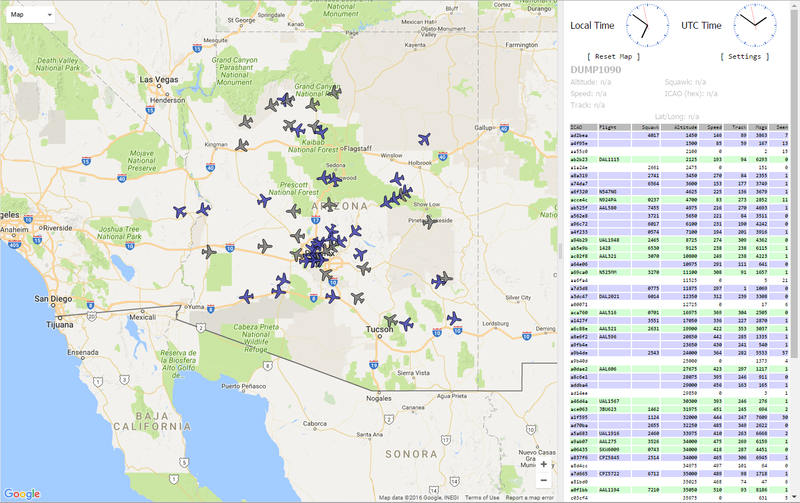 With the new ADS-B receiver set up this past weekend, there’s a commanding view of Sky Harbor airport, even though it’s 53 km away from the receive site. Since my home receive site is on the other side of the Phoenix Mountains, I never see this action. Pretty neat! Installed an ADS-B receiver up on White Tank Mountains over the weekend. Coverage seems pretty darned good, and I lose a/c only when they’ve gone about 1.5° below the theoretical horizon. Below is a screenshot of the display. The a/c out beyond the 200 nm range ring are all at FL300 or greater, but at least according to heywhatsthat.com, they’re all significantly below the local horizon from White Tank. Also seems that I have about a 10 dB dynamic range on the receiver. Signals are never stronger than about -1.6 dBFS and I always lose the a/c when the signal drops below about -12 dBFS. Using HeyWhatsThat.com, it’s very apparent when it drops out. Here’s AAL110 headed NE from LA. I lost it as it was about due east from Cedar City UT. The RSSI is below the minimum required for this particular station to decode successfully. Not that the a/c is over 220 nm distant, but it’s at FL410. So why did it suddenly fade out? HeyWhatsThat gives an indication. From this plot, it’s obvious that the a/c, even at 41k feet altitude, is well below the local horizon and the actual path is probably ducting or multiple knife edges. Either way, it seems to explain for me why I can’t hear farther than this even with the receiver atop a significant “hill” in the Phoenix area. Monitoring aircraft via ADS-B is a terrific hobby and super easy to do. I get to have a display here that shows sometimes hundreds of aircraft (both commercial and general aviation) out to about 200 miles from the house. The above screen capture was from my Raspberry Pi running PiAware and connected to a homebrew 1090 MHz antenna up on the roof of the house. Nothing special in the setup, but look at the range! 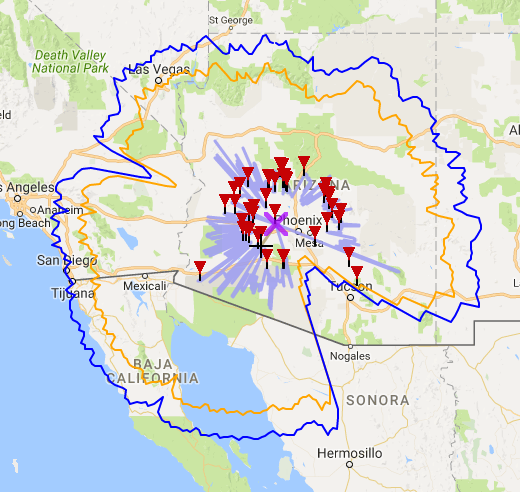 A/C at altitude are hearable out over the Grand Canyon and into California. Occasionally I get a/c into or out of Mexico, and I can see traffic in the southwest corner of New Mexico. 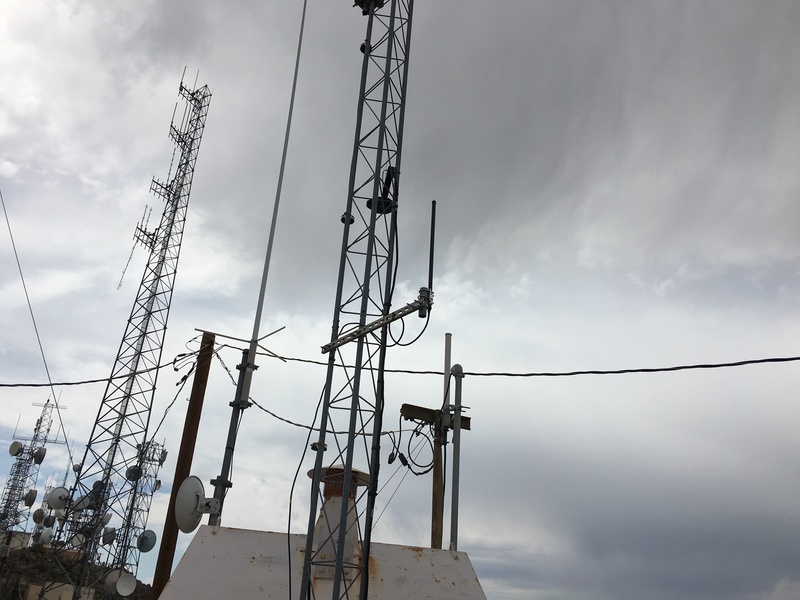 I’m planning to put one of these receivers on a local hilltop, about 3000′ above my house and the Valley floor, and yesterday installed the antenna on a temporary mount on the tower at the site. I connected it to my most recent ADS-B receiver setup, seen below, and was awestruck at the coverage. Was seeing a/c over Los Angeles and Albuquerque! It’s a bit tricky to put a cheap SDR dongle anywhere near radio transmitters, and the hilltop that I was on is loaded with them. In fact, the building in which I have some current monitoring equipment is only 50′ away from a huge comms tower with dozens of two-way radio antennas, and a lot of potential interference. The ADS-B receiver antenna is right in the center of the picture, on the end of a piece of unistrut attached to the tower legs. In the background, nearly a dozen towers bristling with antennas. 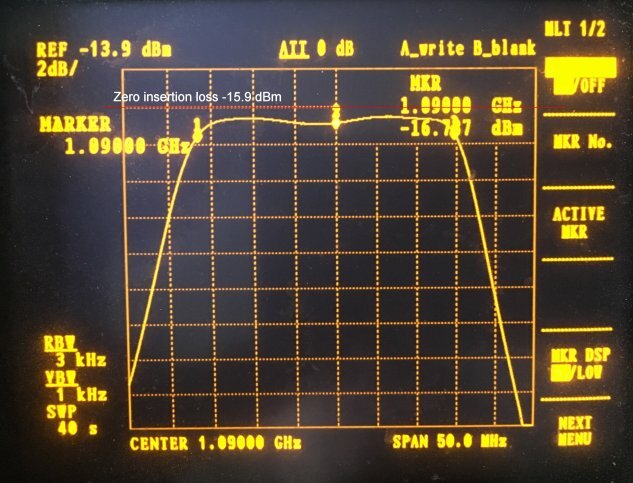 The secret to success is a very good filter in front of the SDR receiver. That black square near the middle of the picture is exactly that. 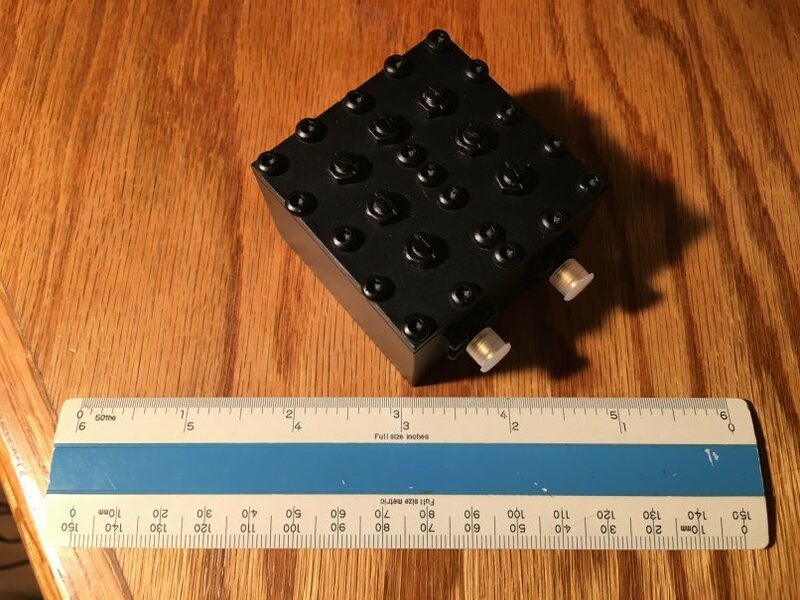 It’s a custom-made cavity filter, only 50 MHz wide, centered at 1090 MHz. Extremely sharp rolloff and ultimate rejection about 100 dB. Really helps the RTL-SDR receiver. However, I wasn’t able to leave the receiver up on the hill yesterday, I was troubleshooting other issues and didn’t have time to set up the network connection to my receiver. Next time I will hopefully get it installed and on the air! I’ve been experimenting with PlanePlotter, acarsdec and a bunch of other things recently, and have had to hack my way to a whole new level of incompetence with Linux in the form of Raspbian. One important thing I just learned was the system flow diagram for dump1090 and piaware. At least now I understand better how messages flow within my setup here, and am starting to learn more about the different ports on dump1090 and piaware, and how mlat (multilateration) works using the aggregation of other piaware receivers through the FlightAware servers. PlanePlotter, however, is a whole new can of worms, perhaps interesting worms, but worms, nonetheless. Raspberry Pi 3 with Wi-Fi and Bluetooth! The new Raspberry Pi 3 goes on sale today. I already have a number of R-Pis running stuff around the house, a couple for ADS-B receivers up on the roof, and while the built-in wired connectivity was always reliable and a terrific feature, the new wireless connectivity, especially the integrated IEEE 802.11n, means that I can remote these bad pups even further, maybe using solar or other wireless power sources. Obviously, more or less straight-line routes are predominant, following the invisible but well-marked flightways across the US, North America, and the rest of the globe. Just as obviously, I’ve been on a/c flights which had to make significant course adjustments due to weather, whether it was hurricanes, mesoscale thunderstorms, or extremely fast jet streams. These are all reasonable things to do. In my rabidness with this new ADS-B monitoring, I discovered last week a route I’d never seen a commercial a/c take. 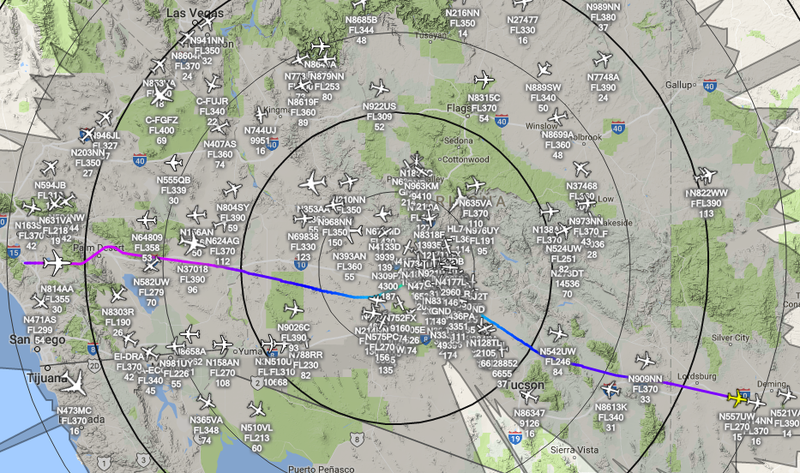 A major US freight carrier’s flight entered my ADS-B monitoring space about 150 miles NNE of me, then executed a dogleg around the west side of the greater Phoenix area, then departed my coverage headed to the ESE toward El Paso. The only reason I even noticed it was that it suddenly popped up on my Virtual Radar Server (VRS) display and it was fascinating in the grand arc it traced around Arizona, yet never touching the ground. This carrier apparently does this regularly, and someone on-line called it a “sweeper” route. The flight is scheduled to depart Denver (KDEN) and arrive Memphis (KMEM), a straight-line distance of only 872 miles. However, it generally takes a circuitous route, which on the day I saw it, was 2108 miles. Here’s a graphic of the same flight, even more extreme, with the route distance well over 2450 miles. The bit that’s in red is the portion that I can hear with my ADS-B receiver. The purpose for the flight becomes apparent when it was called a sweeper. Just in case extra packages show up at the last minute at PHX, ELP, DFW or somewhere else along the route I suppose this flight can divert and grab those. If another plane has mechanical problems at one of the airports along this route, this flight can stop and grab the freight. If your mission is to guarantee delivery next day of someone’s letter or package, it costs you a lot in money and reputation to blame it on mechanical problems or a bin being already full. 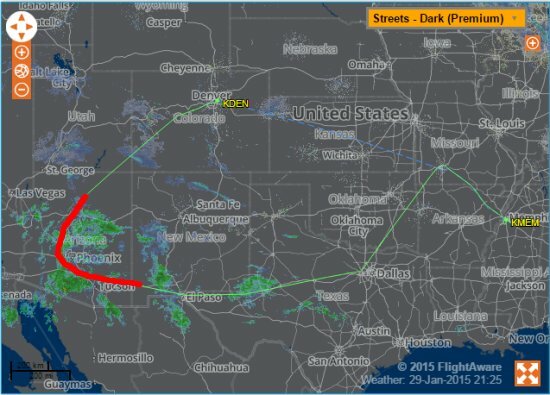 Pretty interesting things to be learned with this ADS-B tracking. In the meantime, I’ve set up an alert at FlightAware for when this flight gets scheduled and I received my first alert just a little while ago. Today my ADS-B receive site here at the house has moved into position 291 on the FlightAware Leader Board! Just a few days ago it was at around 350. There’s only so many a/c that can overfly my general coverage area – Scottsdale Arizona is not Amsterdam, London or Paris. Heck, it’s not even the greater NYC area with its multiple major airports and sheer number of flights. In other words, there’s only so much improvement to be had. The site will never even crack the top 100. In my search for high-ranking sites in the general US west I found the one which I think will be the one to chase. The site is near to the top or atop Abajo Peak (elev 11,365′) in far southeastern Utah. In addition to being a whopping big mountain, Abajo is one of several major laccoliths in the Four Corners / Colorado Plateau region and the tallest thing for 44 miles. There’s even a live webcam atop Abajo. From atop Abajo, the visible horizon is below 0 degrees in nearly every direction, with the 44-miles-away Mounts Mellenthin and Peale the only pieces of earth that just barely break 0° (0 degrees, or horizontal). 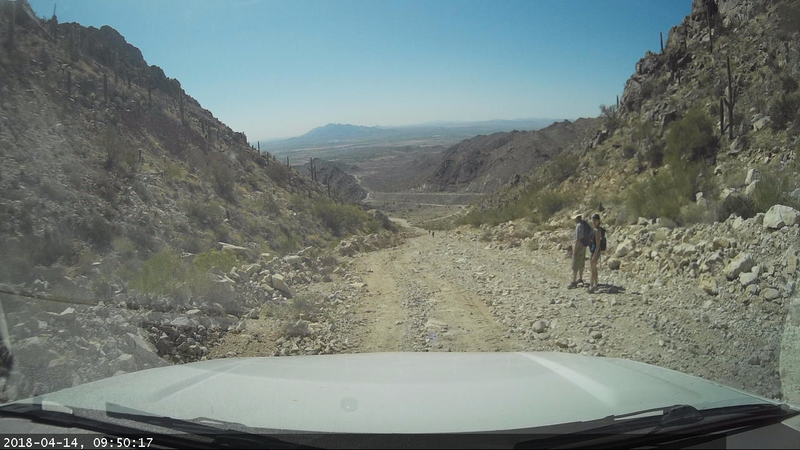 Check out Abajo Peak at HeyWhatsThat. 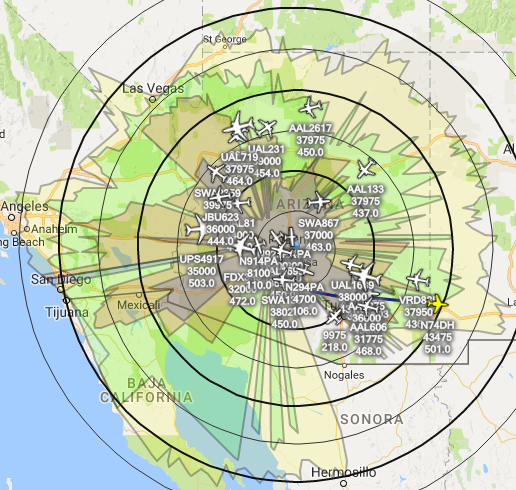 From atop Abajo, a good receiver will capture a fair amount of the commercial traffic crossing over the western US. An aircraft at 40k ft can be over 200 miles from Abajo and still be above the zero-degree horizon. Since the actual horizon at Abajo averages about -0.5 degrees, this adds another 40 miles or so of crows-flight range. And that’s still not including atmospheric refraction and the occasional edge diffraction. 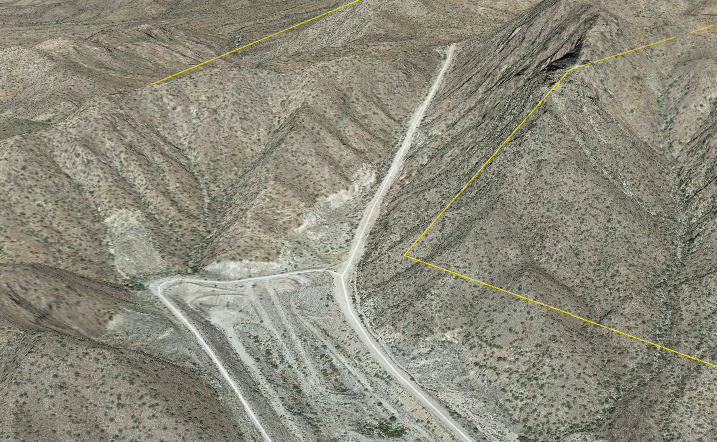 Likely that the Abajo Peak site can hear out to 250 mi / 400 km for an a/c at 40k ft. While a high site is a great thing, the potential number of a/c is limited by population center locations, flight routes, number of flights, number of non-commercial airports, etc. Abajo doesn’t have a major US hub airport next door. Flights headed from Denver to nearly anywhere in the West will pass through, as will flights from ORD to SoCal airports, PHX, and LAS. Flights from DFW headed west to any locations above about Los Angeles will as well, but not the great majority of flights to SoCal, which is a lot of airports. Pretty much any intercontinental from the NE US to the Southwest will intersect that area. There are a bunch of small civil airports in the footprint, as well. Let’s compare Abajo’s stats to the Scottsdale site’s stats for the past two weeks (I know, that’s not much of a sample set, but that’s all I have). What the above two weeks of data appears to show is that Scottsdale gets somewhere on the order of the same amount of position reports per day, but that Abajo sees a whole lot more a/c per day. The Scottsdale best-case 30k ft+ range is to the ESE at just over 240 miles. (It may be just as good to the S, but there’s very few a/c flying down there due to the US/MX border.) However, I’d say the average 30k ft+ range is more like 150-160 mi due to the local hills and more distant mountains. In any case, that’s pretty amazing given that the antenna is 15′ off the ground and in a valley. A little of the performance is likely due to the desert climate and general lack of dense vegetation on exposed ridgelines. I’ll keep working on improving the setup here at Scottsdale and see how the statistics line up with Abajo’s.